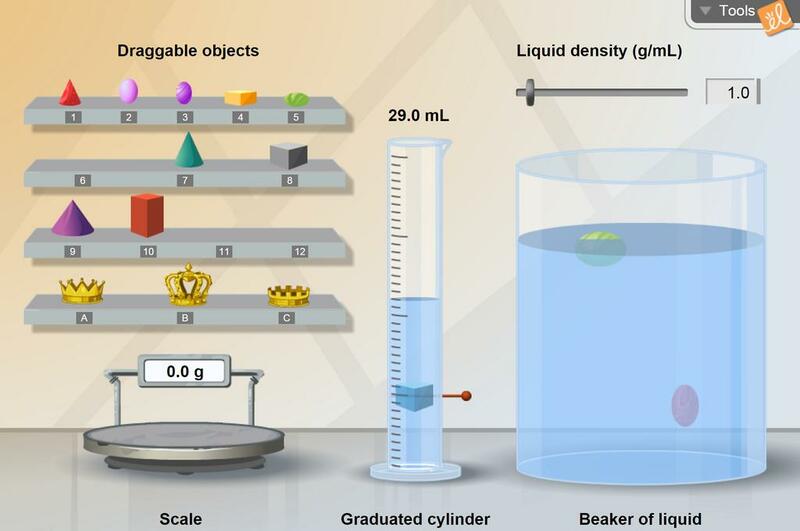 With a scale to measure mass, a graduated cylinder to measure volume, and a large beaker of liquid to observe flotation, the relationship between mass, volume, density, and flotation can be investigated. The density of the liquid in the beaker can be adjusted, and a variety of objects can be studied during the investigation. Students will record their data, calculate density to the nearest 100th, group objects according to densi... (more)ty, and analyze their data. What patterns did they notice? How does the density of the water compared to the density of the object determine which objects will float and which will sink? This is a simple iSN (interactive science notebook) version of a lab using this gizmo. Use this worksheet as the "Extend" of a 5E lesson on density for middle school and high school students. Use this worksheet as the "Explain" of a 5E lesson on density for middle school and high school students. The Key that goes with the modified Student handout. Modify the Student handout and key. This Gizmo helps alleviate the misconception that density can not be found for an irregularly shaped object. Gizmos are educational, exciting, and fun. They provide interactive learning for various concepts.Gizmos enhance student learning. I like how this gizmo gets students to think about what causes something to float or sink. Great for calculating and making predictions. This is a quick way for them to see how densities of various objects compare with each other. Fantastic for expaining buoyancy and density. Excellent discussions arise from this gizmo. I used this Gizmo with my 8th grade science students and the visual cues were extremely helpful for them. Awesome! It's a great way to reinforce density concepts. My kids loved it. Wonderful! I always have students who think that the "heaviest" object has the most density. Great motivator for hard-to-reach students! Love this Gizmo! But, for Activity A, I have the students collect data (section 3) first. Easier comprehension. hands-on to understand the concept of density. This is an awesome way to introduce density to 8th graders. No one leaves without a clear understanding once they have interacted with it!